Passionate in his profession and committed to his work, Ximo Vicedo develops an important interpretative and pedagogical work. 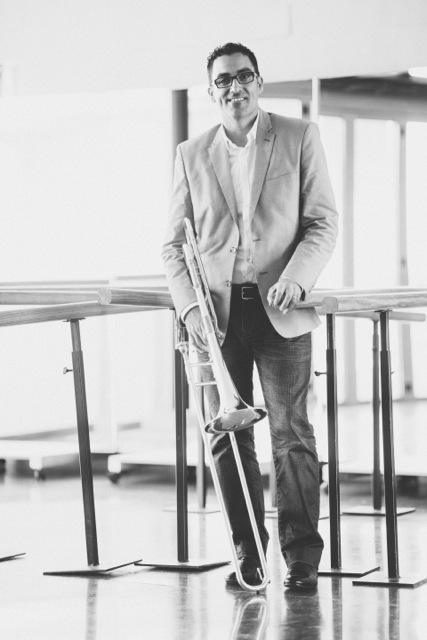 He is Principal Trombone of the Spanish Radio Television Symphony Orchestra and collaborates with Cadaqués Orchestra, Mozart Orchestra and Mahler Chamber Orchestra. He is a professor guest at several Spanish youth orchestras and teaches master classes and recitals in Spain, Portugal and Colombia. He began his studies at the Santa Cecilia Music Group in his hometown, Castalla (Alicante), continuing at Onil (Alicante), Cartagena and Madrid, at the Brass Academy “Ciutat de Vila-real” with Inda Bonet and at the Conservatoire Superieur de Musique in Paris (Troisième Cycle) with Gilles Millière. Ximo has performed as a soloist with the Spanish Radio Television Symphony Orchestra (RTVE), Symphony Orchestra Prix du CSMDP, Albacete Symphony Orchestra, CSMA Brass Band, City of Barcelona Orchestra and Madrid Orchestra.